The, SuperStar Aquarius today celebrated arriving at her new homeport Kota Kinabalu, the city capital of Sabah, Malaysia for her seasonal deployment from 6 November, 2013 to 30 March, 2014. An official ceremony featuring local cultural performances was staged by the Sabah Tourism Board at the terminal. Government officials, port authority representatives and locals welcomed the ship carrying over 1,100 international passengers from Taiwan, Hong Kong, Australia, China, the Philippines and Southeast Asia on an 8D7N relocation cruise to Kota Kinabalu and showered our passengers with local souvenirs. William Ng, COO for Star Cruises, said, "Today is a milestone moment for Star Cruises as we become the first international cruise line to homeport a ship in Kota Kinabalu." "Sabah has been a top tourist destination for decades. With lush primary rainforests, sub-aquatic splendor, magnificent mountain, fantastic local cuisines and colorful cultures, Sabah is an incredible place for adventurers, a paradise for divers, and a playground for families. "As an industry leader, Star Cruises has never stopped introducing new routes and creating new itineraries in the region. 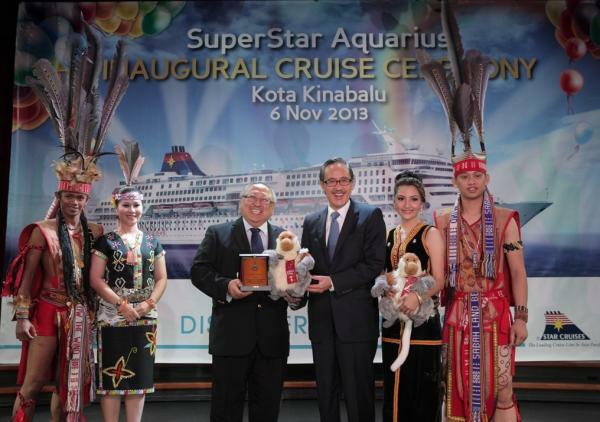 This deployment denotes our commitment to make Kota Kinabalu an international cruise hub. We are confident our deployment will attract not only domestic but also regional and international passengers to Sabah." At the ceremony, NG also thanked all parties in Kota Kinabalu for supporting this homeport deployment. The welcome ceremony was graced by Yang Berhormat Datuk Seri Panglima Masidi Manjun, minister of tourism, culture and environment, Sabah and other representatives from the government, ministries and authorities. The SuperStar Aquarius offers four-day/three-night cruises from Kota Kinabalu to Muara and Bintulu every Sunday with a number of exclusive shore excursions. From Wednesday to Saturday, the SuperStar Aquarius sails one-night cruises.